This article originally appeared in American Way, the magazine of American Airlines, February 2014. Durango is well-known as the starting point for the historic narrow gauge railroad to Silverton. But with the free-flowing Animas River running through town and the rugged San Juan Mountains within view, it has become a gateway for outdoor activities in Southwestern Colorado. In addition to the beauty of its natural setting, Durango’s Old West history, Southwest-inspired shopping, and newly creative cuisine make it a top travel destination. Built in 1887, the purportedly haunted Strater Hotel is a prominent landmark in downtown Durango. Within the hotel you’ll find the world’s largest collection of American Victorian antiques, many of which decorate the 93 rooms. Enjoy cocktails at the hotel’s Diamond Belle Saloon, fine dining at Mahogany Grill, and a show at the historical Henry Strater Theater. The luxurious four-star General Palmer Hotel, also a renovated 19th century building, is conveniently located next to the railroad depot. Prefer something smaller and quieter? Go a few blocks off Main Avenue to the Rochester Hotel and Leland House where you’ll be treated to a daily gourmet breakfast in a flower-filled courtyard. This boutique hotel features 15 rooms with décor inspired by Western movies filmed in the area. 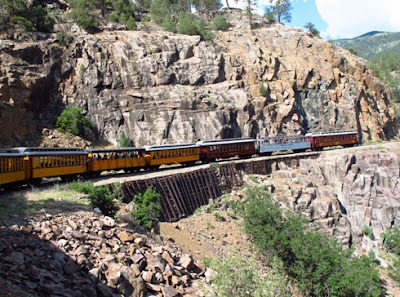 Combine a ride on the Durango-Silverton Narrow Gauge Railroad with a jeep tour over 13,000-foot passes in the San Juan Mountains, or get your adrenaline flowing with a white-water rafting trip. Play golf on a hillside overlooking Durango at Hillcrest, a public course just past Fort Lewis College on Rim Drive. On your return to town, stop to visit the Center of Southwest Studies at the college and admire a glorious overview of the city below. In town, ride bicycles along the River Trail (rent cruisers at the Rochester Hotel), then raft or float in a tube down the Animas River. Explore downtown, a nationally registered historic district, stopping at Durango DiscoveryMuseum and art galleries like SorrelSky and Toh-Atin for Native American treasures. Hillcrest is a public golf course with outstanding views. Strike out on one of many hiking trails: The 500 mile Colorado Trail starts in Durango and ends in Denver, but even a short jaunt provides a taste of nature including views of the Rockies. Prime hiking is also available during the summer in the San Juan Mountains, and in winter the slopes of Purgatory at Durango Mountain Resort attract skiers of all levels. Just an hour’s drive away you can see original cliff dwellings and learn about culture of the Pueblo Indians at Mesa Verde National Park, an UNESCO World Heritage site. Raft or tube on the popular, refreshing Animas River. A plethora of talented chefs celebrate Durango’s culinary passion at numerous festivals, craft breweries, and fine restaurants. Steamworks Brewery Co. is a Durango favorite where guests trash peanut shells on the floor while enjoying pizza, sandwiches, or New Mexico style foods. Anything you can roll into a tortilla you can find at RGP’s Flame Grilled Wraps, a popular lunch spot. Even if you’re from Texas and think Coloradans don’t have a clue, give the ribs, steak, and brisket at Serious Texas Barbeque a try—might make you humble. Growing in popularity are innovative, independent restaurants such as Chimayo, which offers eclectic selections. Aptly named, Main Avenue is a shopper’s delight—no matter what kind of goods you’re looking for. Jewelry Works offers beautiful Southwestern designed turquoise and coral pieces. Get everything you need for outdoor activities at Gardenswartz, a locally-owned sporting goods store. Find fashionable and unique clothing and accessories at Silk Sparrow. After dinner, choose delectable morsels at the original—yes, the very first--Rocky Mountain Chocolate Factory. Enjoy the beautiful San Juan Mountains on a drive or hike.